PEEPS marshmallow candies sweeten up the holidays whether you add them in as stocking stuffers, colorful additions to baked goods, accents to art projects, or just indulge in a delicious treat. Be on the lookout for the newest additions to the PEEPS holiday lineup - PEEPS Milk Chocolate Dipped Sugar Cookie Flavored Chicks ($1.99 - $2.49 / 3-pack) and PEEPS Chocolate Dipped Candy Cane Flavored Chicks ($1.99 - $2.49 / 3-pack). My ultimate favorite has always been PEEPS Gingerbread Flavored Men, ($1.49 - $1.69 / 6-pack), now available in a 3-pack ($0.79 - $0.99). You can find PEEPS at food, drug and mass retailers nationwide, including the PEEPS Shop at the Toys "R" Us Times Square and FAO Schwarz at 767 Fifth Avenue, which both just opened in June. 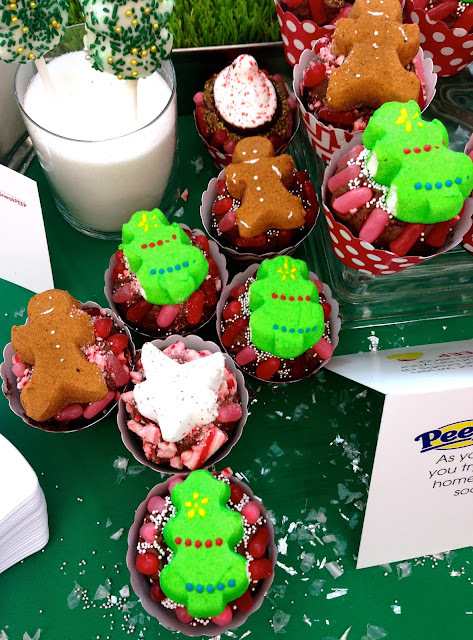 During the PEEPS holiday preview, I had a chance to sample these amazing desserts and view fun craft projects. I was so excited to share these recipes. Hope you enjoy them as much as I will this holiday season! 1. Prepare cupcakes according to package directions. Allow to cool completely. 2. Prepare frosting or open can of premade frosting, pour into a mixing bowl. 3. Combine frosting with 1/4 cup of crushed candy canes. Mix well. 4. Frost cupcakes with candy cane frosting. 5. Top cupcakes with PEEPS Gingerbread Men and PEEPS Trees. Tip: By using different PEEPS, cupcake wrappers and sprinkles.candies, you can create a variety of different looks from just one batch of cupcakes. 1. Remove PEEPS Trees and PEEPS Peppermint Stars from their packaging. 2. Slowly slide PEEPS on to each of your sticks or straws, stopping just before the straw pushes through the other end of the PEEP. 3. Lay out baking sheet and line with wax paper. 4. Melt chocolate coating according to the package directions and apply to PEEPS shapes. 5. Coat shapes with sprinkles or crushed candy canes and let cool. 1. Using kitchen scissors, cut up 5 PEEPS Snowmen or PEEPS Chocolate Mousse Reindeer into bite-sized pieces. 2. Divide yogurt among 4 single-serving dessert dishes, reserving 1/4 cup for topping. 3. Spoon 1/2 cup of the apple chunks over yogurt in each dish. 5. Top each with 1 tablespoon of the remaining yogurt and spoon 1 tablespoon of caramel topping over each. 6. Add a PEEPS Snowmen or PEEPS Chocolate Mousse Reindeer to each dish, sprinkle with pecans or walnuts. 2. Remove Sugar Cookie dipped PEEPS from their packaging. 3. Prepare 12 pretzels and set them out on the sprayed wax paper. 4. Melt caramel bits according to directions on the package. Once caramel is melted, spoon or brush onto each pretzel. 7. Once caramel has set, prepare chocolate coating according to the package directions. 8. Dip pretzels, one at a time, into chocolate coating and return to wax paper-covered baking sheet. Sprinkle with sea salt. 9. Top with PEEPS Chocolate Dipped Sugar Cookie and Candy Cane chicks. Makes 12 pretzels. Allow to set approx. one hour. Store loosely covered. 1. Place one PEEPS Peppermint Flavored Marshmallow Star on each peppermint stick. 2. Prepare each envelope of hot chocolate according to package directions and pour into serving mugs. 3. Top each serving of hot chocolate with whipped cream. 4. Place one peppermint stick into each serving of hot chocolate. 1. Place 5 PEEPS Chocolate Mousse Reindeer on a cookie sheet and toast under the broiler in your oven for 1 to 2 minutes or until charred on top. 2. Take out of oven and let cool. 3. Pour milk, sour cream and ice cream into a blender. Add the 5 toasted PEEPS Chocolate Mousse Reindeer and mix for 3 minutes or until well blended. 4. Pour milkshake into serving glasses. Top each serving with a PEEPS Chocolate Mousse Reindeer. 1. Using the hot glue gun, glue one 9" cardboard to one side of the 9" foam ring. When dry, glue one 9" cardboard circle to the other side of the 9" foam ring. 2. Using the hot glue gun, glue one 12" cardboard circle to one side of one 12" foam ring. When dry, glue one 12" cardboard circle to the other side of the 12" foam ring. 3. Repeat step 2 for the second 12" foam ring. 4. Stick the wooden dowel vertically through the center of all three rings to give the craft support. If necessary, cut ends of dowel down to be flush with craft on top and bottom. Use glue gun to secure the dowel at top and bottom of craft. 5. Cut two pieces of ribbon to desired length for hanging. Staple one end of one ribbon to the bottom left side of the 9" circle. Staple one end of the other ribbon to the bottom right side of the 9" circle. Tie the loose ends of each ribbon together in a knot or bow for hanging. 6. Place the craft flat on a table so that the ribbon is on the bottom. 7. Place PEEPS Marshmallow Snowmen around the perimeter of the 9" circle. Use a hot glue gun to secure the shapes to the cardboard. 8. Cut PEEPS Marshmallow Snowmen in half and place face down in the center of the 9" circle until the entire circle is covered. 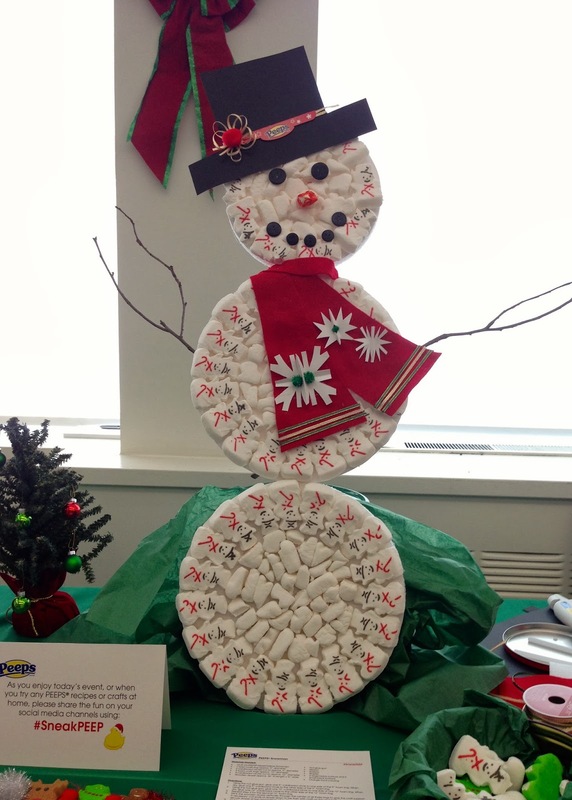 Use the hot glue gun to secure the PEEPS Marshmallow Snowmen pieces to the cardboard. Let dry. 9. Repeat steps 7 and 8 with both 12" circles. Let dry. 10. Use the hot glue gun to attach two large black buttons to the 9" circle for the Snowman's eyes. 13. Add holiday decorations as desired and let dry before hanging. 2. Cut a piece of ribbon to your desired length for hanging. Wrap the ribbon one time around the top of the wreath. Tie a knot or bow at the opposite end of the ribbon. 3. Place PEEPS Marshmallow Holiday Shapes as desired around the wreath, using a hot glue gun. 4. Add holiday decorations as desired. Warning: The PEEPS Holiday Wreath is for craft purposes only. Candy used to decorate this craft must not be eaten. Potential supervision is advised.